Editors Note: The following post was originally an editorial piece written by Bob on October 23, 2009, almost two years prior to the start of his blog. It is said that a company is only as good as its worst employee. It would stand to reason then, that how a company handles a workers' compensation claim is largely only going to be as good as the skill, knowledge and commitment of the front line manager who initially deals with the situation. A corporation could have an extremely well defined policy and reams of documentation covering every conceivable situation; but if the guy on the front line is not properly trained or held accountable, it is all out the window. And it can be a very expensive window. I do not make assumptions as to the validity of the injury claim. It is entirely possible that this was not a work related injury. That is not the point. The point is that a “front line manager”, either through ignorance or intentional deceit, denied this employee his rights due him under the law. That can have very expensive consequences for the company that employs them both, and can generate additional costs that all of us as final consumers ultimately pay. My nephew works for a “big box” retailer. They are a retailer that many love to hate. Communities fight to prevent their opening new stores, and then shop there in droves once they are built. They are accused of many wicked and evil things, by people with a wide variety of perceived grievances. I am not one of those people. I happen to love this particular big box retailer. I have bought many things there – food, detergent, tools, computers, even flat panel TV's. I admire the efficiency they have developed, and personally believe they have done far more to help our economy than hurt it. But they are only as good as their worst employee. This is not a “big box” issue. It is an issue that can affect any company, of any size. It can add incredible cost to the system, cost that could have been prevented, had the on site supervisors been apprised of policy and the law, and then followed them. Issues like this are why employees hire attorneys, where one might have otherwise not been needed. Worsening conditions from delayed medical treatment, as well as state issued fines and penalties for non-compliance represent more avoidable costs that can be added. So, why does this happen? I generally categorize these incidents into two general areas; Ignorance or Intentional Deceit. Workers' compensation is a mysterious and confusing world to most people who are not entrenched in the industry. Many managers and supervisors have no clue as to how the system works, or what they are required to do in the event of an injury or illness. To some, it just represents a burden of paperwork and inconvenience. This often leads to a common tendency to “blame the injured”, even if the injury was not their fault. Some managers believe that they do not have to do anything if, in their judgment, the injury was caused by the injured's own negligence. Ignorance in this area is a training issue, and one that should be directly addressed by every company. This is a far more sinister issue, but no less costly for the company that has a manager that fits into this category. A manager may have a personal dislike for an employee, and deny them the right to file, where they would not have done so for another individual. Most often, however, there is a financial incentive for the manager who purposely denies an employee due process. That is not to say a company intentionally rewards this behavior, but rather inadvertently does so. Many companies provide financial incentives for maintaining safe workplaces. This also means that the manager may suffer financially if that goal is not attained. A manager who may lose some or all of his/her bonus might be highly motivated to prevent the reporting of accidents. This is an area that goes beyond training for the company. This is an area that requires clear policies and accountability for the managers' actions. I can look at my own personal work history to see these categories in play. 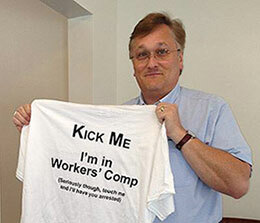 I did not “cut my teeth” in the workers' compensation industry. My family was in the restaurant business, and after college I immediately went to work in the industry I knew, restaurant management. I was fortunate, as I was hired by and worked for a company that clearly defined the requirements of handling workers' compensation claims, and held people accountable for not complying with these standards. Still, I was very ignorant of the process beyond the initial report. All I knew of workers' comp in those days was if I had a serious injury in my restaurant, some guy named Frank Gates would gig my operating statement $50,000 for something called a “reserve”. I knew Frank was just doing his job, but in those days it was all greek to me. My company also would withhold a managers bonus if an accident frequency rate exceeded a certain quota, or if a lost time claim occurred. Did I resent an employee who failed to use required equipment and cost me $2,000 when injured? You bet I did. Whether it is a restaurant in southwest Florida, or a big box retailer in southwest Colorado, the issues of workers' compensation compliance are the same. Next week I will offer some suggestions on how companies can see that this does not occur within their ranks. Companies must be ever vigilant in making sure their policies and vision are communicated throughout the organization, down to the last employee. The cost of ignorance and deceit, both in dollars and morale, are too high to ignore.